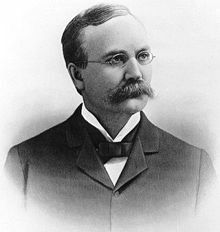 Today in Masonic History Alva Adams is born in 1850. Alva Adams was an American politician. Adams was born on May 14th, 1850 in Iowa County, Wisconsin. Some time prior to 1876 Adams moved from Wisconsin to Colorado. There he served in the first Colorado State Legislature beginning in 1876. Adams would go on to serve three terms as as Governor of Colorado, the first from 1887 to 1889. The second from 1897 to 1899. The third was the shortest and most noteworthy. In 1904, Adams was a candidate for Governor for his third, non-consecutive term. His Republican opponent, Adams was a Democrat, was the incumbent Governor James Peabody. The race was highly contested and both candidates were accused of using questionable campaign strategies. When Adams emerged the victor after the election, Peabody accused Adams of being an illegitimate Governor. After political wrangling, the Colorado state Legislature removed Adams from office after only two months. Peabody was installed as Governor and served for only a day before resigning. Adams also served as U.S. Commissioner-General to Australia, New Zealand, Java, Siam, and China. Adams son, Alva Blanchard Adams, also went into politics and served as the United States Senator from Colorado. Alva Adams passed away on November 1st, 1922. It is unclear what lodge Adams belonged to in Colorado. Regardless there is ample evidence of an active masonic career. An entry from the proceedings from the Grand Lodge of Wisconsin reports in a section for news from other jurisdictions that the Grand Lodge of Colorado had two special communications in 1890. At both special communications the Grand Orator, former Governor Alva Adams, gave speeches. He was knighted in Pueblo Commandery No. 3 Knights Templar. He also served as the second Sovereign Grand Inspector General for the state of Colorado an Active member of Supreme Council of the Ancient Accepted Scottish Rite of Freemasonry for the Southern Masonic Jurisdiction.